Tooth crowns have several names. They also are part of a few dental procedures. In fact, crowns work both sides of the dental fence. They act to provide both a practical and esthetic purpose. This is an apt description for both purposes. The device sits on top of the tooth and provides a visual illusion. It recreates the tooth as being healthy, white and perfect. As a "cap," it tops the tooth and provides both an esthetic and practical purpose. A tooth crown is also a dental crown. This merely refers to its role in dentistry. Yet, as a dental crown, it may cap a tooth that is apparently healthy or one that is imperfect, decaying or destroyed. This may be part of a cosmetic dental surgery such as an implant. It may also be a simple capping of the tooth. Either way, the resulting look is pleasing to the eye. Of course, the naturalness of the resulting smile will depend upon the materials the dentist uses in the process. Dental crowns are full restorations. As such, the current fashion is to make them as natural as possible. In fact, this is not a new approach. While gold teeth have been in use for centuries, other more natural-appearing substances have been also been popular. Among the earliest materials were bones – either animal or human and ivory. The ready availability of ivory made this substance popular up until the late 18th century. By this time, people had become tired of ivory. The response to this was the invention of porcelain teeth. 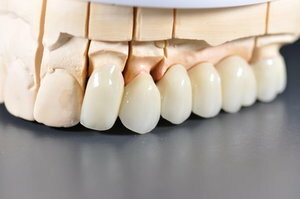 As a result, porcelain quickly became the choice for crowns, dentures and bridges. Today, 90% of all the crowns in American mouths are composed of porcelain. This includes porcelain-fused-to-metal (PFM). The latter increases the durability of porcelain. Yet, while porcelain remains popular, other substances are still utilized for both practical and cosmetic dentistry. In all cases, the crown may be separate or free standing. It depends upon the amount of pressure expected to press on the crown as well as other related factors. The process for creating and implementing a crown is more elaborate than that required for many other dental procedures. This includes that for porcelain veneers. It involves preparatory work in your mouth and in the laboratory. The procedure begins with a visit to the dentist. The first step is to grind down the offending tooth or teeth. This may or may not affect the structure of the tooth. If the structure is obviously in danger, this may require the putting in place of an onlay or a full-coverage crown. This acts as support and allows a proper and effective "bite." The dentist will also take an impression of the tooth or teeth requiring a crown. At the same time, he or she will fit you with a temporary crown. This will stay in place until the laboratory creates a permanent one. The final stage, except for check-ups, is the attachment of a permanent crown. This one will remain in place. In fact, some permanent crowns have the ability to last for up to 30 years. Generally, however, the longevity of a crown is closer to 10 years. A permanent crown may go without a hitch. Yet, problems can also occur. Tooth crowns, dental crowns or caps are prosthetic coverings for teeth. They may work in conjunction with implants to replace teeth totally. They may also act to preserve or conceal the integrity of a cracked tooth, one eroded over time or teeth destroyed by decay. A cap replaces the external character of the tooth. Wearing a crown, therefore, provides protection as well as an aesthetically pleasing appearance for our teeth.